A Dutch auction is a price discovery process in which the auctioneer starts with the highest asking price and lowers it until it reaches a price level where the bids received will cover the entire offer quantity. Alternatively, a Dutch auction is known as a descending price auction or a uniform price auction. Dutch auctions are appropriate for instances where a large quantity of an item is being offered for sale, as opposed to just a single item. A Dutch auction can be used in an IPOInitial Public Offering (IPO)An Initial Public Offering (IPO) is the first sale of stocks issued by a company to the public. Prior to an IPO, a company is considered a private company, usually with a small number of investors (founders, friends, families, and business investors such as venture capitalists or angel investors). Learn what an IPO is to figure out the optimum price for a stock offering. They are also used by government agencies for the public offering of Treasury bills, notesCurrent DebtOn a balance sheet current debt is the portion of debt due withing a year (12 months) and is listed as a current liability and part of net working capital. Not all companies have a current debt line item, but those that do use it explicitly for loans that were incurred with a maturity of less than a year., and bondsTrading & InvestingCFI's trading & investing guides are designed as self-study resources to learn to trade at your own pace. Browse hundreds of articles on trading, investing and important topics for financial analysts to know. Learn about assets classes, bond pricing, risk and return, stocks and stock markets, ETFs, momentum, technical. In the Dutch auction process for an IPO, the underwriterUnderwritingIn investment banking, underwriting is the process where a bank raises capital for a client (corporation, institution, or government) from investors in the form of equity or debt securities. This article aims to provide readers with a better understanding of the capital raising or underwriting process does not set a fixed price for the shares to be sold. The company decides on the number of shares they would like to sell and the price is determined by the bidders. Buyers submit a bid with the number of shares they would like to purchase at a specified bid price. A list is created, with the highest bid at the top. The company works down the list of bidders until the total desired number of shares are sold. The price of the offering is determined from the last price covering the full offer quantity. All bidders pay the same price per share. 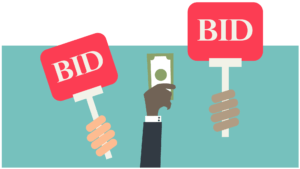 A Dutch auction encourages aggressive bidding because the nature of the auction process means the bidder is protected from bidding a price that is too high. Assume that the company, Compu Inc., is using a Dutch auction to price its shares for an IPO. The company is looking to sell a total of 400 shares in its IPO. In this example, the IPO would be priced at $120 per share because the last bid of 15 shares at $120 filled out the total number of shares that Compu Inc. is looking to offer. Investors B, A, D, and E would be able to purchase shares for $120 instead of their initial bids of $450, $300, $200, and $150, respectively. Investor C would be out because the number of shares is already filled. Setting a price for an IPO can be difficult. Traditionally, investment bankers (underwriters) would take the top management of the company on “roadshows” to meet with institutional investors and assess their interest in the IPO. These roadshows offered the underwriter an opportunity to market the stock in advance, thereby hopefully increasing demand for it, and also the opportunity to learn how much per share large, institutional investors were initially willing to pay for the stock. However, setting a price for an IPO through roadshows is sometimes unreliable. For example, Twitter was priced at $26 for its IPO, based on gauging public interest at roadshows, but traded as high as $45 on the first day of trading. This is called mispricing, where the IPO is priced too low. The feedback the underwriter received from the roadshows was obviously misleading in terms of public interest in acquiring the stock. A Dutch auction is used to minimize the increase between the offer price and the opening price of the offering (therefore minimizing underpricing). While it usually results in some bidders paying less for the stock than they were willing to, it at least protects the underwriter and the company from having to sell hundreds, or perhaps thousands, of shares at a ridiculously low price. Google (Alphabet Inc.) relied on a Dutch auction to minimize underpricing and to earn a fairer price on its IPO. Although Google went public at $85 a share and climbed nearly 30% in two days to close at $108 a share, the IPO was considered a success due to the initial uncertainty in the effectiveness of a Dutch auction. At that time, many market analysts criticized the Dutch auction process. Many of them were afraid that investors would collectively submit a low bid and cause Google to open at an unfavorably low price. In hindt is speculation on whether Google would have been able to set a higher opening price if it had gone the more traditional IPO route. Read more from Market Watch about the reaction to Google’s dutch auction IPO. Capital Raising ProcessCapital Raising ProcessThis article is intended to provide readers with a deeper understanding of how the capital raising process works and happens in the industry today. For more information on capital raising and different types of commitments made by the underwriter, please see our underwriting overview.